Within our paving slabs and patio collection you will find Paving Circles and Paving Squares and paving slab patio packs. These are statement centre pieces for your patio and garden or garden landscaping project. The Midnight Star or Aztec Sun paving circles enhance your patio, and will be the talking point of your garden. Although a simple addition, with their unique quality, they will add charm and intrigue. All of our paving circles and squares, add beauty and will be the focus of your patio. 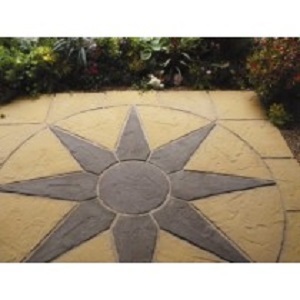 Also, in our range of paving slabs and patio kits, we offer paving patio packs to make beautiful designs on your patio such as our Aztec Sun Circle, our Midnight Star in Buff Gold, the popular Compass Rotunda, all also available with a squaring off kit to finish the patio slabs off nicely.